How Much Does it Cost To Fly To Pikesville? The cheapest flights to Pikesville found within the past 7 days were $101. Prices and availability subject to change. Additional terms may apply. Although you may try and resist the urge, you know that when the travel bug comes, there is only one way to get rid of it. Thankfully, Travelocity is here to help nip that travel bug in the bud with great deals on flights to Pikesville. Browse through our inventory to explore a wide range of cheap flights to Pikesville to solidify your next big trip out of town. Whether you are heading out on a business trip, exploring a place you have never been for pleasure or are bringing the family on the annual vacation, we have the perfect getaway waiting for you. In no time, you will be day dreaming of your plane landing in Pikesville as you anxiously await to exit the plane and explore what Pikesville has to offer. Considering all the amazing local food and culture in Pikesville, we won't hold this against you. When you are ready to embark on your next big adventure, Travelocity will be right here waiting to open the doors to the garden so that you can go and smell the roses. When you decide to book and travel is entirely up to you, but don't wait too long because we have some of the best deals on the web and they won't last long. Take time to go through our huge selection of cheap flights to Pikesville to find the best deals that fit into your budget. If browsing on your phone while your boss isn't looking is more your thing (we promise we won't tell), consider checking out Travelocity's mobile app which allows you to take advantage of all our flights to Pikesville without having to compromise your work computer's search history. If you are looking to save even more, you can easily save up to $537 when you bundle one of our cheap flights to Pikesville with one of our hotels. So why are you waiting around? There is no better time than now to start booking that next trip. Start your search now to book one of our flights to Pikesville today! Question : Which hotels are located near airports or major attractions in Pikesville? Answer : We've put together a list of hotels in Pikesville close to airports and popular sights to see. Check out the hotels below. All of them are within proximity to must-see attractions and major airports in and around the city of Pikesville. 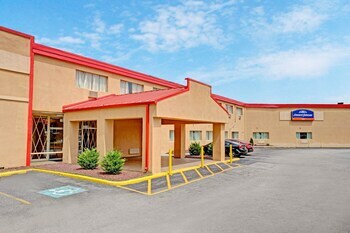 Ramada Pikesville/Baltimore North: Situated in the suburbs, this hotel is 2.5 mi (4 km) from Milford Mill Park and Swim Club and within 6 mi (10 km) of Jewish Community Center of Baltimore and Dorothy Parker Memorial. Stevenson University and Pimlico Race Course are also within 6 mi (10 km This hotel has a 2.00 star rating. DoubleTree by Hilton Baltimore North/Pikesville: Situated in Pikesville, this hotel is 2.5 mi (4 km) from Milford Mill Park and Swim Club and within 6 mi (10 km) of Jewish Community Center of Baltimore and Dorothy Parker Memorial. Stevenson University and Pimlico Race Course are also within 6 mi (10 km) This hotel has a 3.00 star rating. Howard Johnson Pikesville: Situated in Pikesville, this hotel is within 3 mi (5 km) of Milford Mill Park and Swim Club, Jewish Community Center of Baltimore, and Dorothy Parker Memorial. Pimlico Race Course and Sinai Hospital are also within 6 mi (10 km). This hotel has a 2.00 star rating. Question : What are the top attractions in Pikesville? Answer : Pikesville has over 19 points of interest for you to choose from. We suggest checking out Pimlico Race Course and M & T Bank Stadium first because they are the most popular attractions in Pikesville. Don't forget about other highly recommended spots like Fort McHenry, Baltimore Museum of Art, and Maryland Zoo. Get out there and see what the city has to offer on your trip to Pikesville! This hotel looks like a Motel 6 that has not been rentovated. I was nervous walking through a corridar to get to my room because I could hear a couple loudly arguing. The ceiling in the bathroom had a hole in it. The chair in the room was too dirty to sit on. The shower head was nice.